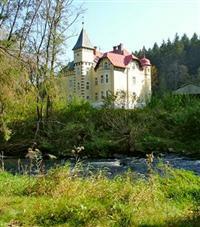 The Hotel Zamecek Kaplice is situated near the Austrian border. Guests will find that the hotel offers easy access to many attractions, including the castle. Such museums as the Museum of Torture and the Museum of Puppets are also nearby. The Hotel Zamecek Kaplice is located a few hours away from the Prague airport by bus or taxi and five hours away by train. Local taxis and rental cars offer access to nearby attractions, but due to the narrowness of the city’s cobblestone streets, most attractions are easiest to reach by foot. Each of the guestrooms at the Hotel Zamecek Kaplice offers a modern décor. All rooms include wireless Internet access as well as television. All rooms offer remarkable views and include private en-suite bathrooms. Guests of the Hotel Zamecek Kaplice will find many shops and restaurants throughout the area. The hotel offers an onsite restaurant for guests to enjoy. The hotel also offers gardens as well as a beautiful woodland location.